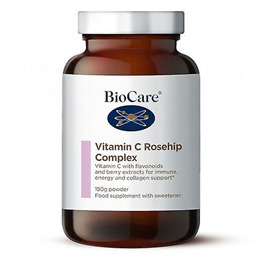 BioCare Vitamin C Rosehip Complex provides a readily absorbable form of vitamin C together with bioavailable forms of zinc and manganese in a powder form that is suitable for people who have difficulty or prefer not to swallow capsules or tablets. 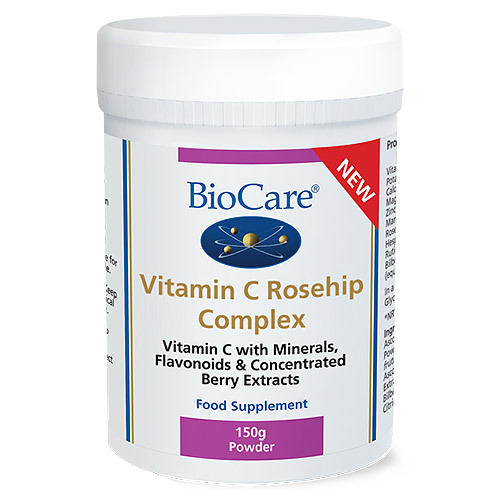 The Vitamin C Rosehip Complex is a buffered, low acid form of vitamin C to reduce stomach irritation. Vitamin C contributes to normal collagen formation for the normal function of skin and the normal functioning of the nervous system. Both vitamin C and zinc contribute to the normal function of the immune system, while contributing to the protection of cells from oxidative stress with manganese. Sweeteners (Xylitol & Steviol Glycosides), Vitamin C (as Ascorbic Acid), Potato Maltodextrin, Magnesium Ascorbate, Apricot Powder (Prunus armeniaca Fruit), Blackberry Extract (Rubus fruticosus Fruit), Rosehip Powder (Rosa canina Hips), Calcium Ascorbate, Zinc Ascorbate, Potassium Ascorbate, Sweet Cherry Extract (Prunus avium Fruit), Citrus Bioflavonoids Complex, Rutin, Bilberry Extract (Vaccinium myrtillus Fruit), Manganese Ascorbate, Citric Acid. One rounded scoop (5g) taken daily (mixed into liquid) with food, or as professionally directed. This product contains a silica gel bag to absorb moisture. 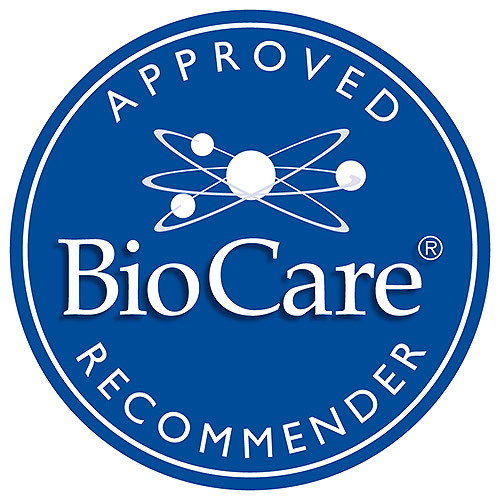 Below are reviews of Vitamin C Rosehip Complex - 150g Powder by bodykind customers. If you have tried this product we'd love to hear what you think so please leave a review.